The cloud has allowed many businesses to profit from its flexibility, power and its relatively low cost of entry. It has been used by companies to outsource some or all of their IT applications and infrastructure since as early as the 1990s. Today, companies can take advantage of a wide variety of software and infrastructure solutions, from the ability to use dedicated cloud-based hardware to ready-made shared solutions like Dropbox. 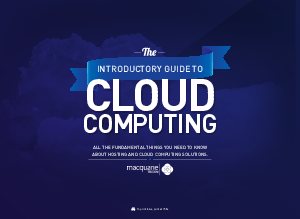 Download this guide now to learn more about hosting and cloud computing solutions.